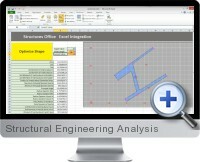 Excel Structural Engineering Analysis integrates with Excel as an embedded object for performing advanced plastic bending and structural analysis visualizations. The standalone C+ application can also be used independently or integrated into other applications such as Matlab and Mathcad. Once integrated into Excel, the structural analysis options can be configured in VBA for specific engineering projects and options within the worksheet enable analysis to be performed from data already residing with the spreadsheet. Support for cross-section, area, elastic and bending properties for construction materials. Plastic analysis through numerical methods including the Cozzone method. Geometry is defined with non-uniform rational B-splines (NURBS). Provides high quality and general purpose sectional analysis tools. Sectional properties support geometric and multiple modulus elastic calculations. Restrained and unrestrained elastic and plastic bending analysis with ultimate loading. The structural analysis solution is fully programmable for specific analysis requirements.